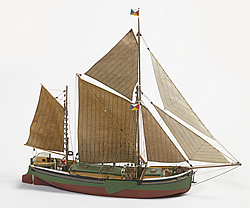 Billings Boats BIL601 Will Everard Coat Bark 1/67 scale wood ship kit! A 280-ton bark built for F.T. Everard & Sons in Great Yarmouth in 1925 to 1926. The ship is owned today by P & O Containers Ltd. In 1982, Northern Europe’s most beautiful captain, according to the press, took command of the ship – 24-year-old Sue Harrison, who had obtained her Master’s Certificate in 1979.